Araella sheepishly looks down at her feet when Morrolan goes on about the frivolous use of spells. But they're all I got! She finds her common travelling spot in the middle the group, and prepares to keep exploring. Last edited by FrancisJohn on Tue May 23, 2017 4:38 am, edited 3 times in total. "Just don't feel comfortable being low on options." Day 14, 12:54 - The Foundry Having decided on where to go next Vlad led the way with Hellsing to return to the throne room. Everything was quiet as before. Near the entrance to the great chamber was the 10 foot wide stairs leading up. From the location of the stream running through the foundry, it was logical that what lay beyond had to be over it. The massive door was shut at the top of the stairs, with no landing right before it. 2. Broken benches, medium bodies provide difficult terrain for medium creatures or smaller. Vlad looked at the double doors as the group stopped in front of them. "Here we are....did we ever check these for traps?" 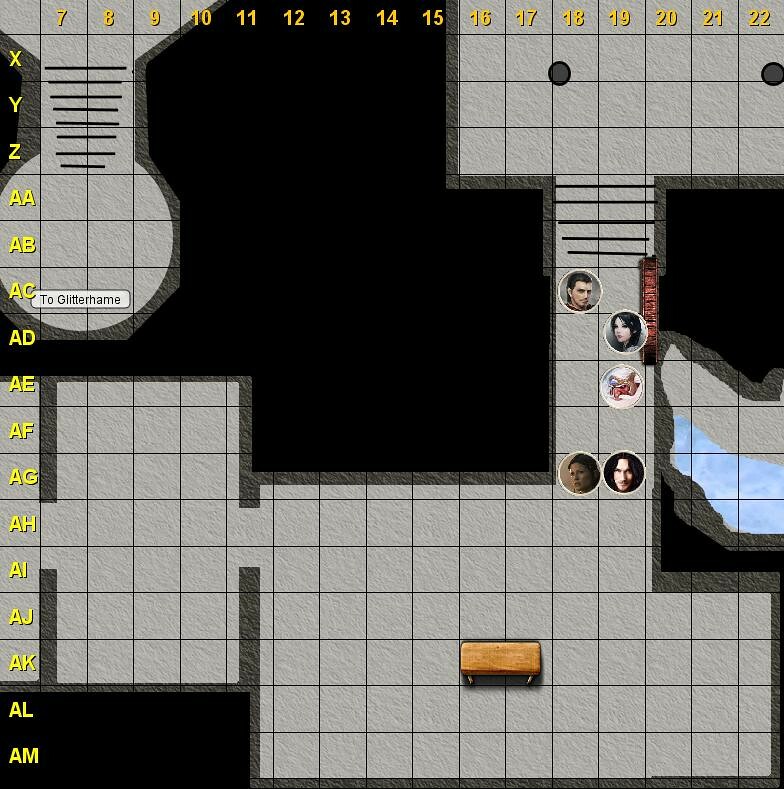 The swashbuckler wouldn't put it past the dwarf builders to have put something on the stairs...especially if it led to any kind of vaults. Araella stands there, hands on her hips, as the group reaches the massive door at the top of the stairs. "Hellsing, how do you know what to look for?" The plucky young sorceress squints around the door, trying to see what Hellsing always seems to find. Last edited by FrancisJohn on Sun Jun 04, 2017 6:45 pm, edited 1 time in total. She stepped up to the door, glancing at Araella. She nodded at her, beckoning with a tilt of her head. She crouched in front of the door, examining the edges of the door first. She examined each place in turn as she spoke, pointing out likely locations for either the trigger or the delivery method, pausing to show Araella each spot. Standard Action: Take 20 on a +13 search of the door..
Current Weapon in Hand: Composite Longbow. Having followed his companions to the bottom of the stairs, Orekk looked over the stonework with the consideration that good craftsmen had spent time in its construction. Unable to see anything which alarmed him for now. Move Action: Look over the stairs and doors with stone cunning. Day 14, 12:57 - The Foundry After some examination, Hellsing found nothing harmful about the door. It was not even locked. The large door was going to open away from the elven scout and into the space on the other side. Orekk did not see any unusual stonework about the stairs either, it looked to be the same craftsmanship as the rest of the chambers and stairs of the nearby rooms. It never hurt to be safe and double check, Vlad mused to himself as he waited for Hellsing to finish checking the stairs for traps. Finding none, the swashbuckler mounted the stairs and stood by the door. He drew his rapier, having sheathed early. He wanted to be ready for in case they found more grey dwarves, the invisible ones, or something new. The dark haired man then put his free hand on the door. "SHall we?" he asked the others. If there were no objections, Vlad would see about opening the door. Standard Action:open door if others are ready. Araella openly marvels at Hellsing's very thorough explanation. "Thank you, that surely will be useful to know." After Vlad asks if every one is ready to go, Araella simply smiles and nods in assent. Last edited by FrancisJohn on Fri Jun 09, 2017 6:20 am, edited 1 time in total. Covering the rear Morrolan was in place near the rear, looking for trouble coming up behind them. However in the large throne room, there was three different directions to cover until they climbed the stairs. He moved closer to the stairs and behind a pillar. He kept his spiked chain in hand. Day 14, 12:57 - The Foundry At the top of the stairs, the opened door revealed a corridor heading south that opened up into a large room lined with hearths. Pots, pans, cauldrons and kettles laid scattered throughout the room, and an archway to the right led into a pantry that likely was filled with ancient foodstuffs. The room once served as the kitchen for the dwarven smiths. Suddenly, there was the sound of wood scraping on stone a big wooden table shuddered and began to move towards the open door and corridor! Everyone is up for Round 1. The sight of another animated object sends shivers straight down Araella's spine directly to her trigger finger. Before she knows it, the bolt flies wide into the far wall. She lets out a gasp as she realizes that she was much too hasty in targeting her shot. She calls out, "Get that thing, quickly!" Araella immediately rearms her crossbow with another bolt. Hellsing’s eyes narrowed as she saw the table lurch toward them. She glanced at Araella for the briefest of moments, remembering the animated carpet. Surely Araella had not forgotten about the incident; nor had anyone else, with all the grim-humored jokes they had made about animated objects. And in spite all of their joking, here was yet another object. Now this was a pattern. It made Hellsing think of Idalla and her story of the wizard who had imprisoned her. Such a wizard, who could cast some spell that kept otherworldly people in a room against their will, would also be able to enchant magical items to attack. Part of her thought that this threat could not be as simple as they thought, and that there was a far greater danger in this room. Perhaps an uneven floor or some other kind of trap meant to be triggered as they fought the table. It would be a risk moving into the room first, without knowing what else lurked within, but she fought best when she had mobility, so she darted forward and to the right. She saw an open doorway ahead of her, so she stood just in front of that with her back toward the wall. She wanted options, even if she was slightly more at risk by standing near an unknown area. Hellsing fired off an arrow, and it sunk into the table with a loud thunk. Table Smashing Morrolan moved forward to stand where the elven scout had been, getting a good look at the table stumbling towards them. He knew what to do if it got closer as he whirled the spiked chain around very quickly, ready to strike if it got closer. "Let that thing come closer to me and I will turn it into kindling!"